This, the latest instalment in a Naxos series from Jean-Luc Tingaud and the RTÉ orchestra, is the first I’ve heard so far. John Whitmore was quite positive about their Dukas album, although Ralph Moore was underwhelmed by their Bizet. Tingaud has also recorded some d’Indy, this time with RSNO, performances that David Barker characterised as ‘nice-to-have but not essential’, especially when compared with superb discs from Rumon Gamba and the Iceland Symphony, some of which I reviewed a while back (Chandos). As it happens, one of my comparative versions of Poulenc’s Les Biches suite is also a Chandos release, with Yan Pascal Tortelier and the Ulster Orchestra. Recorded in 1991, it’s part of a potentially interesting programme that includes Ibert’s Divertissement and Milhaud’s Le Boeuf sur le Toit. Ditto Charles Dutoit’s Orchestre National de l’ORTF accounts of the suites from Les Biches and Les animaux modèles, plus the Aubade and sundry snippets, among them Poulenc’s Satie orchestrations (Decca, 1995-1996). As for the Sinfonietta, I’ve chosen a 1997 performance with the Luxembourg PO conducted by Jonathan Darlington; it’s coupled with the suite from Les animaux modèles (Timpani). 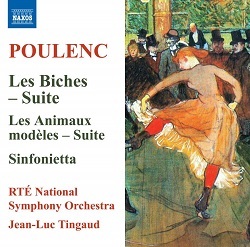 Poulenc wrote two ballets on his own account, Les Biches (untranslatable into English) and Les animaux modèles (Animal Models), both presented here in suite form. As a member of Les Six, infamous for mixing chic and cheek, it’s no surprise to discover that Les Biches centres on a clutch-bag of flirty funsters at a fashionable house party in the south of France. Diaghilev’s Ballets Russes premiered the work in Paris in 1924. Les animaux modèles, in which insects and animals from Jean de La Fontaine’s Fables are transformed into all-too-human humans, was first performed in the occupied French capital in August 1942. Poulenc, ever the subversive, buried defiant, pro-Resistance musical references in the score. So, in the time-honoured tradition of BBC Radio 3’s Building a Library, let’s get weeding. First out is Tortelier, whose account of Les Biches lacks panache. And while the playing is decent enough, the recording is a bit coarse; there’s a fierce treble, too. As for the couplings, they’re average at best. The biggest surprise is the Decca pairing of these suites, which, given a French band and the conductor’s rep in this rep, should guarantee stand-out performances. It’s all very polished, and Dutoit springs the dance rhythms more naturally than Tortelier does, but I longed for greater wit and character. There’s plenty of that in the Satie orchestrations, though. Now for Tingaud. First impressions are entirely favourable, the Rondeau in Les Biches conveying both conviviality and a hint of disquiet. The playing of this Irish radio orchestra is a delight – now that’s what I call panache – and the sound is pretty impressive, too. The Adagietto, now svelte now swoony, is nicely judged, the all-important harp a treat. Goodness, how prosaic – no, dull – Tingaud makes his rivals seem, the Rag-Mazurka brimming with brio and a real sense of fun; deliciously louche woodwinds, a snappy side drum and a brasspberry or two complete the picture. As ever, reviewing a new album with a number of comparisons to hand makes all the difference. I returned to the Tingaud after a few hours with Tortelier and Dutoit, and what seemed rather good initially now seemed much, much more than that. How truly Gallic he makes the Andantino sound, its dynamics and supple rhythms artfully done. And kudos to Phil Rowlands and Mark Dwyer for such an entertaining and immersive recording. As expected the party really hots up in the effervescent finale, the RTÉ orchestra responding as if to the manner born. They’re just as accomplished in Les animaux modèles. There’s a palpable sense of drama and a lush, filmic sweep to the first two movements, not to mention a heightened awareness of the sheer craft and imagination behind Poulenc’s writing. What a grand start to La mort et le bûcheron (Death and the Woodcutter), and how utterly beguiling the rest. High spirits and high drama return in Les deux Coqs (The Two Roosters) and Le repas de midi (Lunchtime). Despite its seeming slightness, this music is just astonishing in its reach and richness; ditto the performance and sound, both of which eclipse the competition at every turn. But before we get to the Sinfonietta, a quick word about Darlington’s account of Les animaux modèles. The performance is intensely dramatic, with plenty of pith and punch; but, most important, the easeful rhythms of Le Lion amoreux (The Amorous Lion) remind us this is dance music, after all. There’s charm as well, and, as I’ve remarked in recent reviews of Gustavo Gimeno’s recordings with this band, it’s a very fine ensemble. They certainly rise to the occasion here, the recorded sound lean and full of telling timbres. Clearly Tingaud doesn’t have it all his own way with this one. What of the Sinfonietta, a BBC commission to celebrate the tenth anniversary of the Third Programme? As Dominic Wells suggests in his detailed liner-notes for the Naxos issue, it’s an atypical Poulenc piece. Darlington gives a wonderfully alert performance, full of colour and detail. Indeed, there are moments in the first movement that remind me of Darius Milhaud’s La Création du monde, written 25 years earlier. Otherwise, the voice is very much Poulenc’s own, asperity laced with lyricism. What a vital and varied reading this is, and how imaginative. Indeed, Timpani have a penchant for pleasant surprises; this lovely album is no exception. Can Tingaud top that? He’s controlled and comparatively ‘straight’, whereas Darlington, much freer, is also more nuanced. In fact, the latter makes Tingaud feel a tad severe at times. Also, Timpani’s spacious and transparent recording suits the ‘hear-through’ aspects of this score rather better than the comparatively close Naxos one does. Don’t get me wrong, Tingaud’s Sinfonietta is very decent – often more than that – but Darlington digs deeper, unearthing some real gems along the way. Overall, though, Tingaud’s new album is a great success; it certainly deserves a place in your collection. There’s so much to enjoy here; not without competition, though.